What if you could create a clickable link to an email that you received, and instantly share it with your bestie right within any messaging service? With our free Unique URL Links for Email Conversations Chrome extension, you can! It’s incredibly easy—and 100% free. If you have a Gmail or G Suite account, you can use the Unique URL Links for Email Conversations tool to create a shareable link to any email with just the click of a button! Sharing emails is such a small thing, but you probably do it all the time. Whether you’re a salesperson, student, or Fortune 500 executive, email-sharing is just a part of life. Wouldn’t it be great if you could do it quickly and seamlessly, through any text-based application? Forget going through the process of forwarding emails to individual people and giving out permissions. 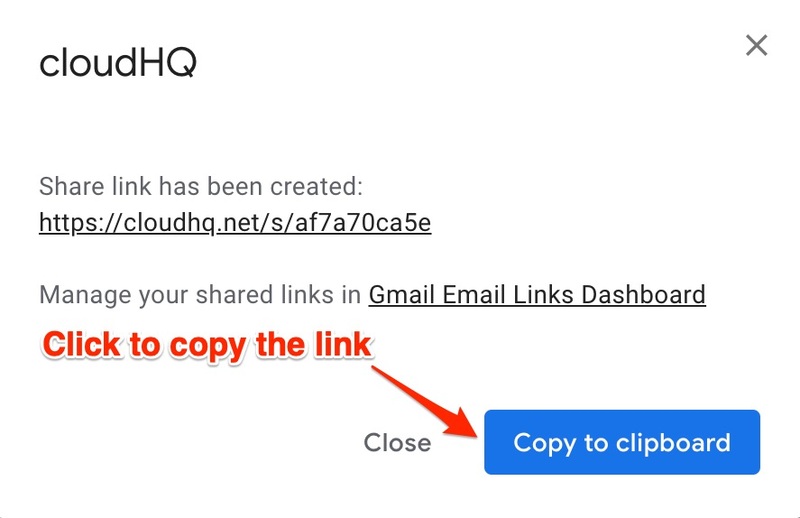 Once you create a clickable link for an email, you can share it just like you would any link—on Slack, Skype, WhatsApp, iMessage, Facebook Messenger, GitHub, Basecamp, Google Hangouts, etc. Copy and paste. It’s that easy. The recipient can click the link to view the email in its entirety… including any attachments! Download the free Unique URL Links for Email Conversations extension from the Chrome Web store by clicking on the “Add to Chrome” button. Once you’ve installed the extension, your Gmail will refresh, and your account will look exactly the same as before—except that you’ll have an unobtrusive link icon added to the top of each email that you receive, to the right of the native trash can Gmail icon. Clicking on that icon creates a shareable link for any email you want someone else to see. After step 2, you’ll get a popup box that looks exactly like the one below, and that popup tells you what your new email link is. If you simply click on “Copy to clipboard”, you’ll be able to share away just as you would with any other link. People tend to reply faster to instant messages than they do to emails. So, if you have an urgent request or need to get someone’s input quickly, sharing your email in a chat message is a no-brainer. You can use any text-based application, even if you’re just messaging someone on Telegram or iMessage. And for instance, if your grandpa is a little technologically challenged but uses Facebook like a champ, you can send him a copy of an email as a link in Facebook Messenger! With a single click, he can see that family recipe that Aunt Mildred emailed you. Imagine being on a video call with your entire department for an end-of-quarter meeting. The department head asks about the numbers from a recent purchase order you received, and wants to see a copy of it. Rather than sharing your screen for everyone to see—and instead of giving out email permissions—you can just drop a link to the email into the chat box, and done. Not only can the department head view the contents of the email you shared, but she can also see the purchase order… even if it’s an attachment. Let’s say you’re writing an email to your boss. You want to tell her about several messages you’ve received from sales leads… but how do you share the information? But you don’t have to do any of that; email link-sharing makes it so much easier! Just click the Email Link icon to create shareable links for each customer email you want to address with your boss, and paste them into your email with any commentary you need to add. It’s totally seamless and organized for both you and your boss- which can be helpful during your annual review. Try Unique URL Links for Email Conversations Today! Check out our Unique URL Links for Email Conversations on the Chrome Web store—installation takes just a minute, and it’s 100% free. Simple, organized, and seamless. Try it today and increase your work productivity!